The Dunkleosteus (Dun-klee-os-tee-us,) is one of the creatures in ARK: Survival Evolved. Dunkleosteus loricaruptor is a very strange creature. It is a fairly large fish, covered head to tail in armored plates, with incredibly powerful jaws. It tends to eat the Island's water-dwelling crustaceans trawling the seabed, as it is not fast enough to catch most of the smaller fish. Dunkleosteus is surprisingly combat-oriented for a fish. Its well-armored body protects it from many creatures, while its bite is strong enough to easily crush through chitinous shells. Dunkleosteus is an incredibly useful fish for coastal communities. Its powerful jaws make short work of the stone and oil formations found throughout the oceanic depths. While harvesting, Dunkleosteus can defend its rider from all but the largest threats in the waters. And once it is past its prime, the Dunkleosteus itself can be harvested for a fair amount of chitin. The Dunkleosteus is a slow, cumbersome fish that slowly wanders the depths of the ocean. It will not deter from its path to attack players, but if it is hurt by any creature (players included) or a player gets too close, it will attack without mercy. If the attacker can hold its position, the Dunkleosteus will flee. The Dunkleosteus is a large fish found in the ARK's oceans. While its body's physique is similar to that of a standard fish with an eel-like tail, its head makes the beast very distinct. The Dunkleosteus's head is totally armoured, except for the eyes. Where most animals have teeth, massive jagged plates of bone exist in its mouth to crush the shells and bones of its prey. These teeth are used by the creature to crush rocks and oil nodes. The Dunkleosteus is slightly larger than a Megalodon, another predator that cruises the same waters. This section displays the Dunkleosteus's natural colors and regions. 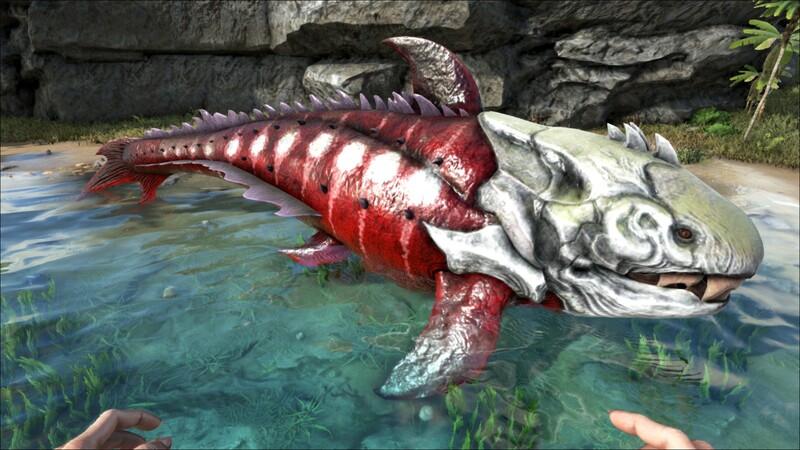 For demonstration, the regions below are colored red over an albino Dunkleosteus. The colored squares shown underneath each region's description are the colors that the Dunkleosteus will randomly spawn with to provide an overall range of its natural color scheme. Hover your cursor over a color to display its name and ID. For example, "cheat SetTargetDinoColor 0 6" would color the Dunkleosteus's "body" magenta. Using the (PC), (PS4), (Xbox One), the Dunkleosteus bites the target. Lure into a cave where you can use a rifle to tranq the Dunkleosteus, requires a creature that can go on land, frogs work well with this method. Kiting the Dunkleosteus in a circle will prevent it from hitting you, allowing a simple solo tame as it has a slow turn and is fairly slow moving. This is made much easier with some points in Oxygen. 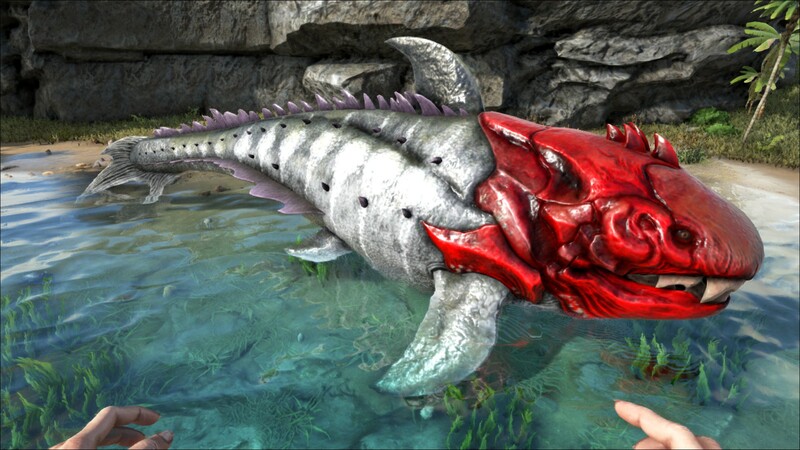 Contrary to popular belief it does not matter where you shoot the Dunkleosteus; it will take vastly reduced damage (and consequently much less torpor) than expected whether it's shot in the body or head. If you plan to tranq a very high level Dunkleosteus it is advised to bring at least 250 arrows if you're using a primitive crossbow. As such higher-quality crossbows are recommended to reduce the endurance test that knocking out a Dunkleosteus can be. A more efficient and less expensive way to knock one down is to just grab them with a Tusoteuthis as the Tuso will inflict torpor over time and arrows won’t need to be expended. Note: This is more time consuming method, so prepare to sit for a bit. This section describes how to fight against the Dunkleosteus. The Dunkleosteus is a large, tank-like aquatic fish that dwells in the deeper parts of the ocean. It is slightly larger than a Megalodon, which ends up hindering it in certain situations. A poor turning radius allows any player to easily kite it around in a circle, giving time for the player to attack. 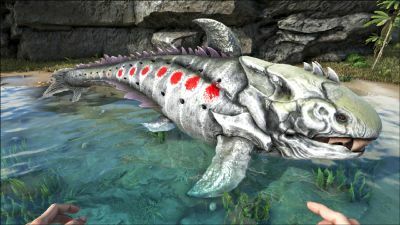 By utilizing the large turning radius of the Dunkleosteus, the player can stay in a safe area while launching arrows via a crossbow, either to tranquilize or kill it. A large sea mount (Megalodon, Plesiosaur, Mosasaur) can be used to kill one quickly, as they have a relatively slow attack rate. It is not recommended to fight the Dunkleosteus with melee weapons, as it does great damage in a single hit. 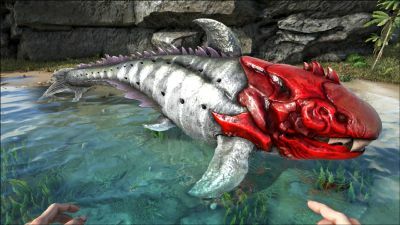 Use powerful sea mounts or crossbow weaponry to kill one, or tranquilizer arrows from a crossbow to knock one out for taming. Do not attempt to punch one or whack at one, as a silly act of innocence can elevate into unfortunate loss of the player's inventory, which may or may not be obtainable after death. The Dunkleosteus has a lot of health and powerful bites. They sometimes emerge from nowhere, so surprising ambushes can lead to a quick death for players whose minds are occupied on other topics.The Giganotosaurus is not the only one that can break stone, the Dunkleosteus can be used to besiege an under water base. They can be easily dodged due to their horrible turning radius. Take the battle to them and out-maneuver the Dunkleosteus so that it cannot harm you. Dino Dossier revealed on 10. July 2015. The idea that they give lots of chitin, as stated in the dossier, is quite strange; given that chitin is a material primarily used by invertebrates and fungi for structural support- but can easily be explained by the animal's natural diet of shellfish, like trilobites. Dunkleosteus had one of the strongest bite forces of any living creature. Its bite was stronger than a crocodile or a modern great white shark. Despite appearances, Dunkleosteus has no true 'teeth' to speak of. The blades seen within its mouth are actually extensions of the jawbone that are sharpened by grinding against one another. Its name means, approximately: "Dunkle's Bone armor breaker" (in honor of David Dunkle; osteus, Greek for bone; lorica, Latin for (chest-)armor, ruptor, Latin for breaker). This page was last edited on 14 April 2019, at 16:28.